You can now buy the repair kit or have your power board repaired through our web store. SYMPTOMS may vary since all caps on the board can go bad and it's impossible to know which go bad before which. 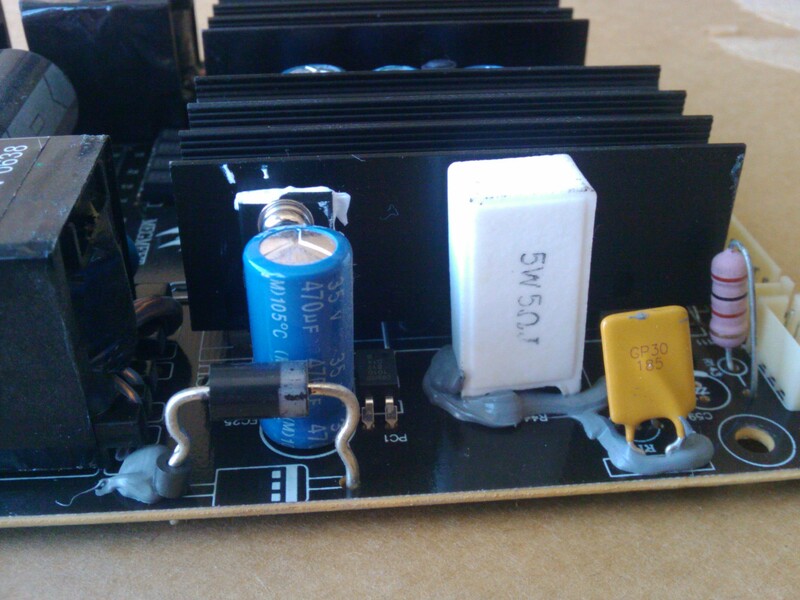 On that last board shown on the picture below almost all capacitors on the secondary side of the power board were bulged and in cases like this it may become fatal first on the inverter power line or on the main power line. Depending on that the TV may stop powering on or may stop losing back light (display) while still working. In our case the Akai LCT3285TA had the typical problem of first not wanting to power on the first time the button was pressed and, after a few weeks, not wanting to power on at all. There were a total of 8 apparently bad capacitors on that board - two at the bottom, three in the middle, one at the top and two smaller ones hiding under the heat sink as indicated above. I think I got a picture of those too, but when I got to posting the blog there was no picture in the phone and the TV was already closed and returned to the customer. Replacing the two below the heat sink required that first the two transistors using that heat sink get unscrewed from it and then the heat sink itself gets de-soldered from the board. That's pretty much all of it...you can get the caps, find replacement and do it all by yourself...it doesn't get much easier than that...you can source the parts or you can just buy them at our store...or you can have us repair the board. Either would be better than replacing the board with another used one that may do the same thing very soon! 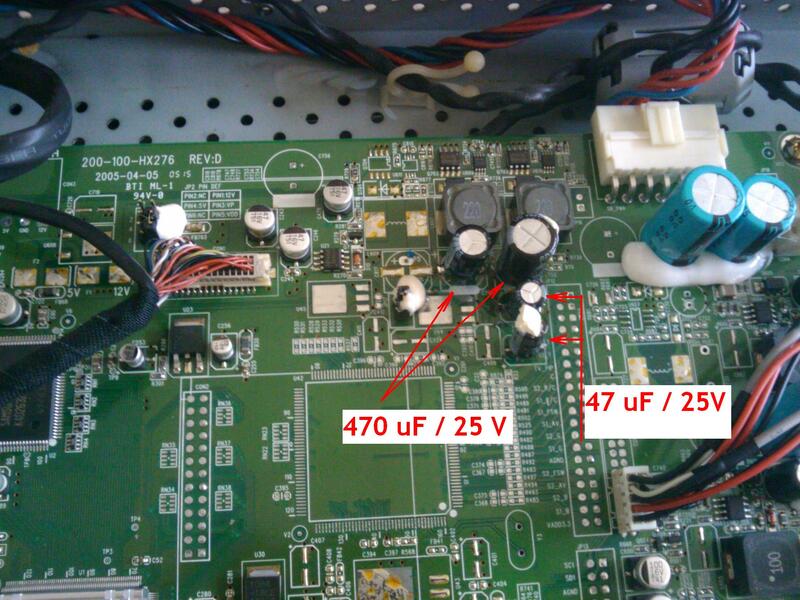 The Proview 3200 / Proview RX-326 is rather old and if you go through all the pain to actually disassemble it it may be worth to read this article to find if you can save a buck or two by repairing the power board and the main board by yourself rather than spending just south of $100 for a replacement of each. 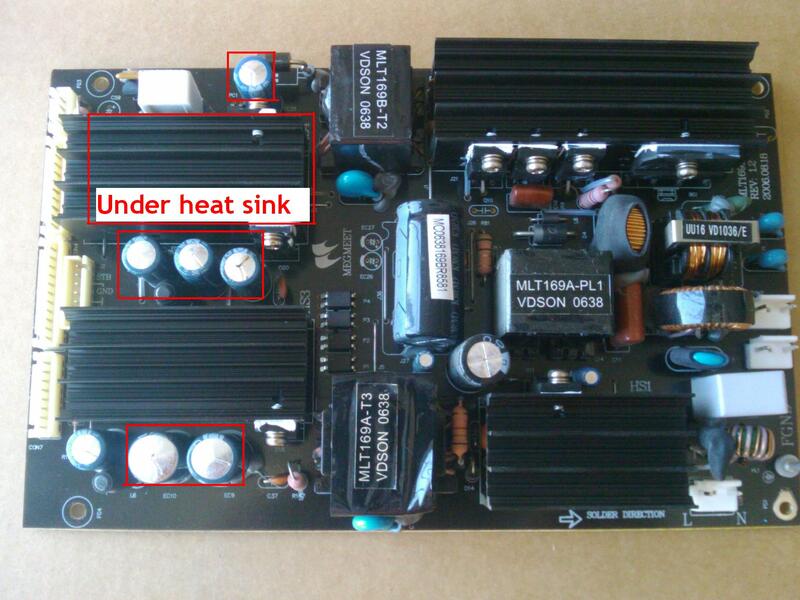 1) Completely dead TV - no front LED, nothing - suggests bad power board 02144-B306. See this article for how to test it (note it's slightly different as its normal output is 12V and not 24V!) and if you need it repaired check the Coppell TV Repair online store. 2) TV comes on, but there's no display back-light. You may be able to see display changes with a flashlight or at the sun, but no back-light - that's either bad inverter or , very often, again bad power board. See the links in the above case scenario for how to test the power board and send it for repair if you have to. 3) TV's standby light comes on, but when powered it either flashes green for a moment and then switches back to standby orange (or red) or switches to green, but display remains dark and you can't switch it back to standby color by pressing power, or display flashes for a second and then TV turns off, or sometimes it may turn on and stay on, but next time you try to turn it on it won't move...or any combination of the above. 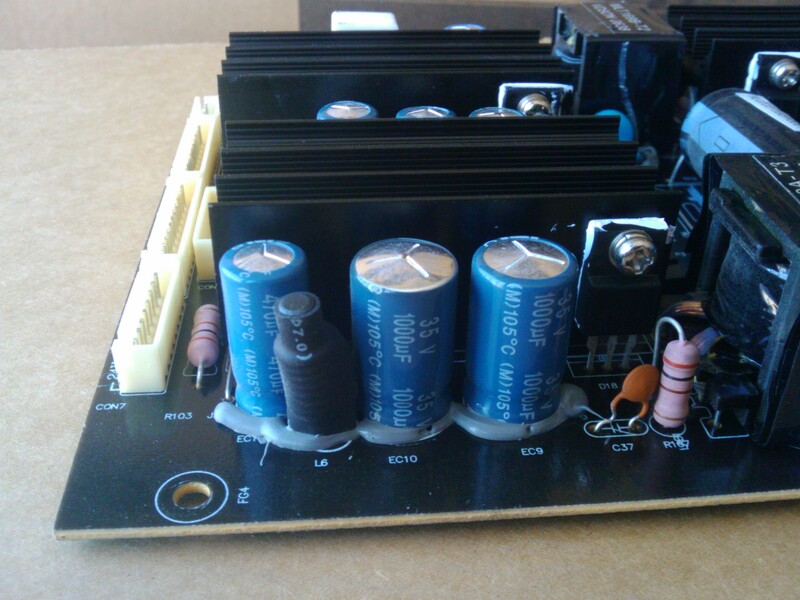 But, while at it, first and foremost again check the power board and make sure it produces reliable 12V on the primary as explained in our article. If that's good then the problem is most likely on the main board 200-100-HX276 . This picture was taken after the replacement was done. 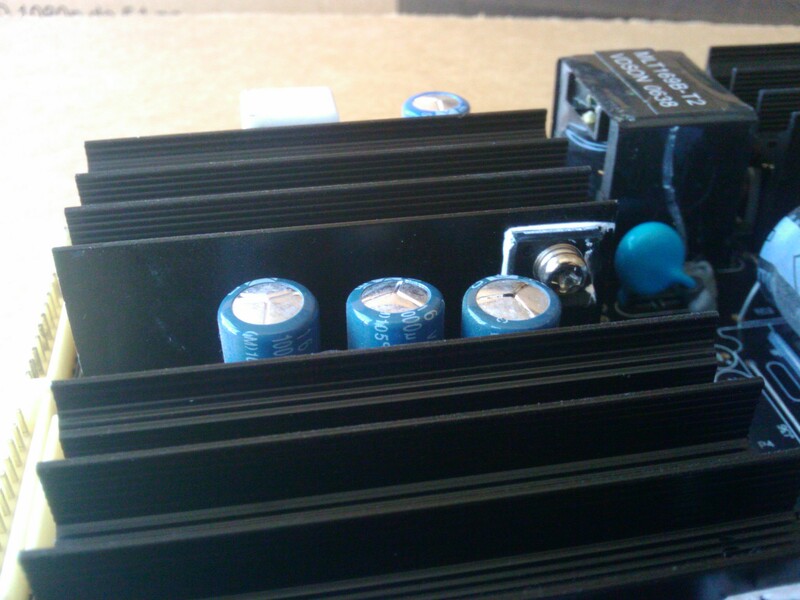 The original capacitors were aluminum ones and did not show any signs of malfunctioning visible to the naked eye. As you can see we've used standard replacements and not aluminum ones. In fact on this picture one of the larger ones is 680 uF. Don't ask - we just did it. If you need the capacitors, drop us a note and we'll add a link for purchasing the four at a reasonable price. But the post here is with the main idea to share the know-how , not to benefit from selling the kit. The replacement itself is not a rocket science, but is somewhat delicate partially due to the tight space. Still way better than having to pay $90 plus shipping for a replacement board!